Vineyard Vines was founded by Shep and Ian Murray 15 years ago. The company started off selling ties, which now sells a wide array of exclusive and affordable clothes and other fashion accessories for men, women and also children. 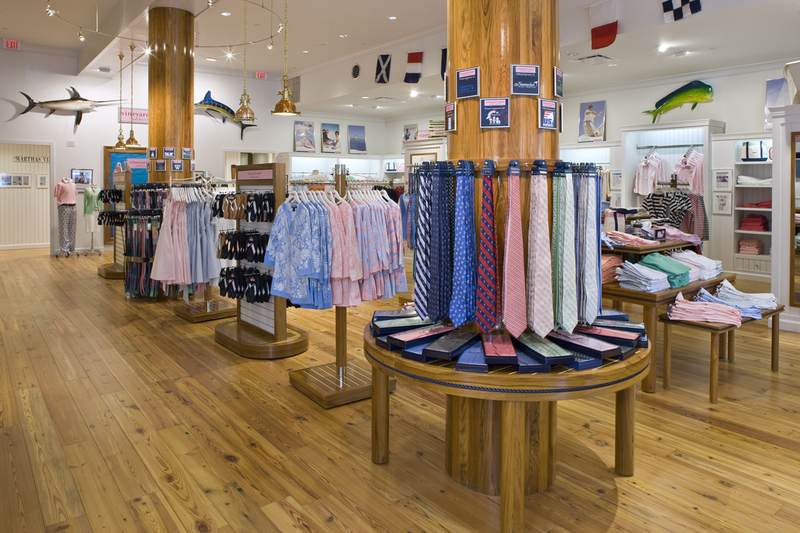 Vineyard Vines’ apparel is sold at over 30 retail locations and over 600 boutique and department stores across the US. The company now employes over 500 people at 30 retail locations and 125 people at the corporate headquarters located in Stamford, CT. Starting off as a really small company, now, Vineyard Vines makes sales of over 100 million USD. 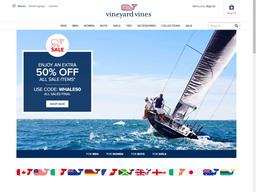 They usually offer free ground shipping on all domestic orders over 125 USD, but you definitely need to make sure you checked out the latest vineyard vines coupons at our website to save more money on your orders at Vineyard Vines! What shipping options do they provide? They charge 8.50 USD for Standard Ground shipping, 18.50 USD for Two-Day Shipping and 26.50 USD for Next Day shipping for orders below 50 USD. They charge 10 USD for Standard Ground Shipping, 20 USD for Two-Day Shipping and 28 USD for Next Day for orders that totals between 50.01 USD to 100 USD. It’s 12 USD for Standard Ground Shipping, 22 USD for Two-Day Shipping and 30 USD for Next Day Shipping for orders that totals between 100.01 USD to 124.99 USD. And for all the orders that total over 125 USD, they provide Free Standard Ground Shipping and charge 24 USD for Two-Day Shipping and 32 USD for Next Day shipping. How long do they take to dispatch orders? Orders that are placed during the business days (Monday through Friday) are usually dispatched within 48 business hours. However, special cases like Flash Sales, and Holiday Seasons may impact the processing time a little. Orders placed during the weekend are highly likely to be processed on the next business day (Monday). You can also get your Vineyard Vines Merchandise the same day if you place the order before 12 PM EST using an expedited services which exclude Saturdays, Sundays and business holidays. Remember that you can also save more money on your orders by using the latest vineyard vines coupons on our website! Once dispatched, the orders are handled by UPS Ground, which promises to deliver the goods within 7-10 business days to most U.S. locations (Unless you choose an expedited UPS service). But, they usually deliver way sooner than that. Once your order has been dispatched by Vineyard Vines and handed over to UPS, Vineyard Vines sends you an email which contains the tracking information. Sometimes this email may end up in your email’s Junk folder, so make sure that you check it out after your order has been dispatched. You cannot change any order at Vineyard Vines’ after it has been placed. However, if you’d like to order more merchandise, you can call their customer care representatives to see if they can add it to the processing order. Well, you can always return the full priced items within 60 days of purchase for a full refund or merchandise credit, after 60 days of purchase for a full merchandise credit and after 180 days for a merchandise credit of last retail value. Remember that the items that are marked as “Final Sale” are not eligible for returns. @NikkinamasteB Hi Nikki, we're just as excited! Which wallpaper did you choose?